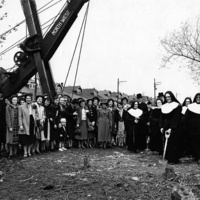 Sister Ellen St John, Provincial, makes the ceremonial first dig at the site for the north wing addition to the high school. 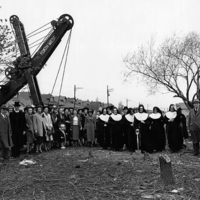 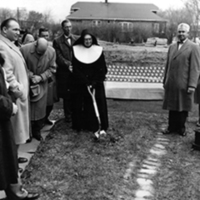 Sister Marie Teresa ceremoniously digging the first hole at the site of the future Notre Dame High School campus. 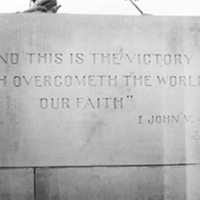 A view of the inscription on one side of the cornerstone at Notre Dame High School in Chicago during the cornerstone ceremony. 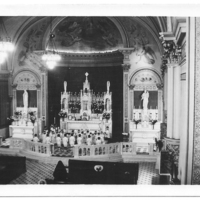 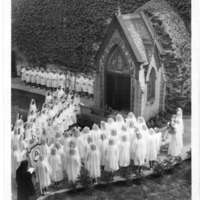 The inscription was suggested by Monsignor Markham, the brother of one of the Sisters of Notre Dame de Namur.